Electro-hydraulic drum brakes can be extensively used for various mechanisms deceleration and stop/braking of various lift, belt transport, port handling, metallurgical and building machinery. The YWW series Electro-hydraulic brake is a normally closed brake, suitable for horizontal mounting. It is mainly used in portal cranes, bucket stacker/reclaimers'slewing mechanism. YWH series brakes are normal-closed brakes, suitable for vertical installation. Thruster is horizontally installed with compact construction. The brakes are mainly used for mechanism deceleration and stop/braking of various cranes, belt conveyors, port handling and metallurgical machinery, especially applied to confined installation space on two sides of wheel. Pneumatic drum brakes can be extensively used for various mechanisms deceleration and stop/braking of various hoisting, belt transport, port handling, metallurgical and building machinery which are equipped with pneumatic source on site. YWZA,YWZC series electro-hydraulic drum brakes can be extensively used for mechanism deceleration and stop/braking of various belt transport, port handling, hoisting, metallurgical and building machinery. The RYK series Electro-hydraulic brake is normally opened brake, which is controlled by foot hydraulic pump and can realize braking unlimitedly. Electromagnetic drum brakes can be extensively used for deceleration and stopping of electromagnetic lifter and various lift,belt transport, port handling, metallurgical and building machinery using DC drive or DC net. And not suitable for machines using AC drive. 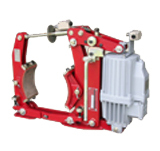 The RWK series brake is a normally opened brake, which operates by foot. Mainly used for deceleration braking of various middle and small crane gantry traveling mechanisms. The dimensiond and braking torque paremeters of YWK normal open drum brakes comply with JB/T6406.1-92 standard(current Chiness Trade Standard)and German DIN 15430 standard.Mainly used as deceleration braking of various general bridges and pordges and portal crane's gantry traveling machanism.It can also be used deceleration/braking of drive machanism of non-lift winch. The RKW series brake is a normally opened brake,which is operated by foot driven hydraulic pump,suitable for horizontal mounting.Mainly used in the slewing mechanism of middle and small portal cranes,When needed,the brake is activated by a manual closed device. Interlocking shoe clearance balancing device (patented technology) constantly equalize the clearance of brake shoes on both sides and make adjustment unnecessary, thus completely avoiding brake lining one side sticking to brake wheel. The brake is equipped with a shoes auto-aligning device. YWL series brakes are two-step brakes which acted on high speed shaft drive mechanism. They can be used for operational brakes and storm brakes. During operation, the brake first generates an adjustable partial torque to realize soft and smooth braking until the machinery stops running, then it starts the second braking to maintain storm braking by providing enough brake torque. The second braking can adjust the delay time compared to the first braking. They are mainly used for storm braking of outdoor cranes and port handling machinery, and as service braking for middle and large belt conveyors. The YKW series Electro-hydraulic brake is a normally opened brake, suitable for horizontal mounting, employIng a thruster as actuator. With the foot controlling switch the operator can release or close the brake. It is mainly used for deceleration braking of portal cranes' slewing mechanism. In a non-operating state the machinery can be braked by a manual close device. Delayed electro-hydraulic drum brakes can be extensively used on large/middle outdoor cranes, having excellent deceleration braking and storm braking performance. It can also be used on large and middle special cranes, realizing stable deceleration braking and maintenance braking. Ideal braking performance of these series products is also represented on Belt transport vehicles. Electro-hydraulic drum brakes can be extensively used for various mechanism deceleration and stop/braking of various belt transport, port handling, hoisting, metallurgical,mining and building machinery.